Gas 'N Go® Modified Atmosphere Systems naturally protect and preserve all types of perishable products. Each system and level of automation is designed to meet the customer's specific needs, and is matched to their production capacity as well as product treatment requirements. No matter what system is selected, all Gas 'N Go® Systems include a sensor-based gas controller that measures and injects the precise gas concentrations and sanitizing treatments. The actual gas percentage needed for each product is programmed into the Fresh ProTech® controller and is accurately injected into each pallet enclosure. In contrast, the competitions time based controller injects an estimated amount of gas, which may not always be exact. The Fresh ProTech® controllers for both the gas injection and the machine automation come with the latest touch screen technology. This allows for quick and easy access to information or when gas levels need to be changed. Switching to different gas levels for different produce, or adding Fresh ProTech® Plus sanitizer treatment is as easy as pushing a button on the touch screen. All Fresh ProTech® equipment is easy to operate because our smart software detects any faults and allows the system operator to monitor each process step and correct any problems. These systems are designed to operate in cold room or industrial environments, and are built tough for years of reliability and cost efficient operation. Their modular design, which includes built-in back-up components, helps assure that they are ready to run when needed. 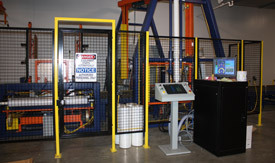 We even provide customized equipment for generating ozone onsite to ensure all sanitizer treatments are safe and effective. 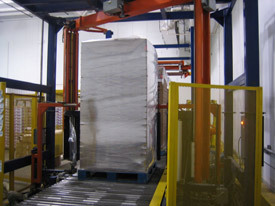 Fresh Tech provides complete systems and everything needed to deliver the best MAP available for palletized products. We have it all; FDA/USDA approved gas, specialty films, bottom and top sheets, plastic pallet bags, tape, labels and more. The service starts with our experienced engineers, who meet with each customer to understand their MAP objectives and needs. We then customize our Fresh ProTech® system to best meet those needs. The system is designed, built, and installed by our technical team, and a technician from that team is assigned to work with that system & customer on an on-going basis. This technician will provide the customer with a day-to-day primary contact for all customer service needs. The FTS technicians train the system operators and perform regular onsite visits, operational repairs and routine maintenance. The FTS team also checks the quality of treated MAP pallets to confirm that proper atmospheres have been achieved, and will adjust the equipment as required for optimum results. This helps assure the system is operational and ready to run when needed. All our systems can be adjusted and controlled on site and monitored by our technicians via remote computer. Complete customer care with 24/7 on-site response services and remote monitoring is available for customers who have Fresh ProTech® Gas 'N Go® Systems and a current use license. FTS complete customer care also includes inventory management, quality assurance, training, repair and maintenance. All Gas 'N Go® systems, regardless of the level of automation, include reliable service and support for customers including access to technical experts. 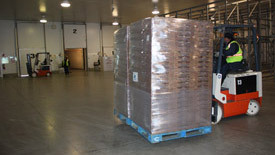 We are dedicated to providing the best MAP systems for palletized products and the service to match. Fresh ProTech® technical services are available to work with customers on both ends of the supply chain to help assure quality arrivals.